Every time I listen to or accidentally hear any of the songs from The National‘s Sad Songs For Dirty Lovers or Alligator I have this one particular day in my mind. It was last September, the 27th to be more precise, and I had all day to myself in a basically unknown city. I’ve been to Budapest several times, but really, there’s always things to see. And even though I would have loved it if I were there with a good friend or a significant other, I think this way was way better. It was this beautiful sunny day, with a little bit of wind. I actually felt chilly a few times, even though I had this striped sweater I really love on. And with all the noise and commotion on the streets, everything seemed so peaceful and just really ok. The only thing I was capable of listening to without pressing ‘next’ in the middle of the song was The National. So I did. On and on, to these two albums only (they were the only ones I had in my player cause I felt like I was ignoring them previously). They are these little gems that pass a lot of people by. Many of the ones I know got into this band when they released Boxer so they are more into it and High Violet. I’m not denying, these are really awesome albums, but seriously, the rest of their music deserves so much more attention. Besides just reminiscing I wanna just say it: don’t be afraid to go alone somewhere, especially if it’s just for a day or two. Chances are you’ll have a great time with yourself and awesome memories that you can totally be selfish about. They will be just yours. Like a great view or a particular moment or sensation. Or maybe just a smile you spotted on a stranger. 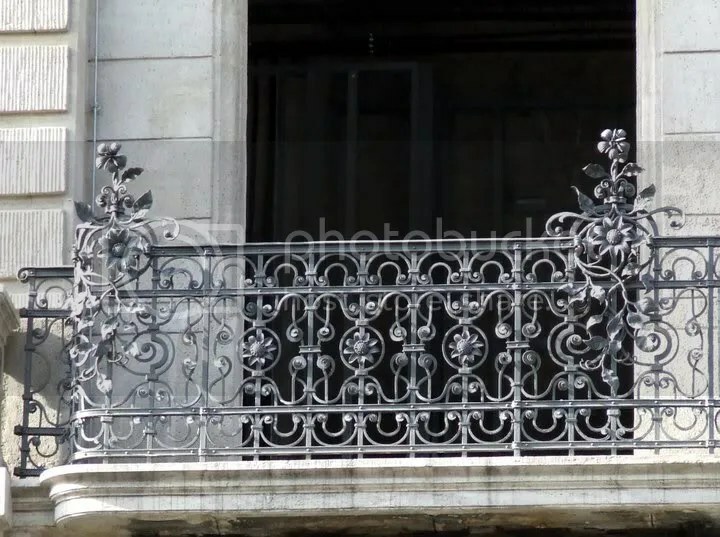 Or that balcony grid with little iron flowers. 1. Name a band or an artist you can’t believe you liked when you were younger. I used to listen to a lot of Pasarea Colibri when I was in my early teens. It’s this Romanian folk band that I grew to dislike more and more with the passing of time. 2. Name a band or an artist you hated when you were younger and you now love. Oh, I used to totally dislike Björk. I thought she was creepy and incredibly weird. And at 17 a certain person played me Pagan Poetry and my big love for her started to form. 3. Name a band or a singer who stood the test of time (you liked from the first time you listened to it/him/her). First that comes to my mind is Deftones (just because I just saw them live). I liked them for 10 years, since I was in my first year of high school and a class mate of mine showed up with White Pony in his hands. But there are more such examples (Radiohead, Pink Floyd, Metallica, Massive Attack), some of them I don’t listen to that often anymore, but I still love them. 4. Name a song you can’t resist to dance/tap to. When I hear The Knife‘s Pass This On I start moving, no matter where I am. I do silly head moves if I’m sitting, funny walk if I’m on the street, tap the handlebars if on my bicycle. And of course I love love love dancing to it. 5. Name an album you like each and every song from. 6. Name a band or an artist you’re so fed up with you never want to hear about anymore. I don’t really interact with other music than my own playlists or my friends’ So I don’t think there are bands I’m that fed up with. 7. Name a band or an album that your partner or friends love and you can’t stand. AC/DC. Never really liked them and grew to totally dislike them. Can’t have just one. To name a few, from the top of my mind: Jeff Buckley‘s Hallelujah, Thom Yorke‘s All For The Best, José González‘s Heartbeats, The Gathering‘s When The Sun Hits. 9. Your favourite song or band right now. Favourite? I can tell you my most listened to lately: Phantogram‘s When I’m Small. On the band part, I’m going through a Deftones craze right now, because I just saw them live :). This is serious. Yes, I’ve had obsessions, but not like this one; not in a long, long time. This is one of those songs I’m afraid to listen to. Cause I won’t get it out of my head once I start to. And it’s like that: whenever I hit play, it ends up on repeat; or I keep hitting replay on youtube. I’ve already posted it pretty much everywhere on the internet (except for here). And I love everything about the song: the music, the voice (oh, Jack ♥), the actual lyrics. But what really gets to me is that piano. You can hardly hear it during the song, I mean, is there, among the other instruments, but come minute 3:38, it’s killer. And it goes right to the most hidden corner of my inner being and disturbs it. But in the corner of my heart your ignorance is treason.